Horizontal curves are those that change the alignment or direction of the road (as opposed to vertical curves, which change the slope). More than 25 percent of fatal crashes are associated with a horizontal curve, and the vast majority of these crashes are roadway departures. The average crash rate for horizontal curves is about three times that of other types of highway segments. About three-quarters of curve-related fatal crashes involve single vehicles leaving the roadway and striking trees, utility poles, rocks, or other fixed objects—or overturning. Most roadway departure countermeasures are effective when applied specifically at horizontal curves. A focus on horizontal curves can prove to be a cost-effective approach to reducing roadway departure crashes. Many of these countermeasures are low-cost and can be installed at prioritized horizontal curves to address safety issues. 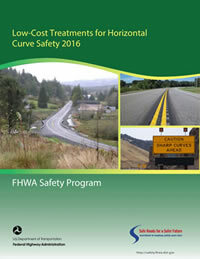 The purpose of this publication is to serve as an update to the 2006 Low-Cost Treatments for Horizontal Curve Safety, FHWA-SA-07-002. The primary audience for this publication is similar to the 2006 document which is local transportation agencies. This publication primarily includes those engineering countermeasures that are relatively low-cost, such as signage and pavement markings. More moderate or higher cost treatments including varying degrees of infrastructure changes are also provided as appropriate, including superelevation, cross section, and shoulder adjustments. It will help transportation agencies and their construction crews understand the available countermeasures and how to select and apply them. FHWA-SA-15-084. Volume 7 in a series of National Cooperative Highway Research Program (NCHRP) reports on ways to reduce injuries and fatalities in targeted crash areas, this Guide identifies 20 countermeasures to address specific safety issues at horizontal curves. The guide describes the strategies and provides step-by-step implementation guidance. This Technical Advisory provides a general overview of factors that should be considered as elements of any Skid Accident Reduction Program. This Technical Advisory was canceled by Technical Advisory 5040.38, “Pavement Friction Management” on June 17, 2010.